﻿ The Gate of Sorrows « Haikasoru: Space Opera. Dark Fantasy. Hard Science. A series of murders shocks Tokyo’s Shinjuku ward, but Shigenori, a retired police detective, is instead obsessed with a gargoyle that seems to move. College freshman Kotaro launches a web-based investigation of the killer, and comes to find that answers may lie within an abandoned building in the center of Japan’s busiest neighborhood, and beyond the Gate of Sorrows. In this adult sequel to Miyabe’s The Book of Heroes, you will meet monsters from other worlds and ordinary horrors that surpass even supernatural threats. Miyuki Miyabe’s debut story, “Warera ga Rinjin no Hanzai” (Our Neighbor’s Crime), won a new writer award in 1987, and since that time she has become one of Japan's most popular and best-selling authors. Miyabe's fantasy novel Brave Story won the Batchelder Award for best children's book in translation from the American Library Association in 2007. 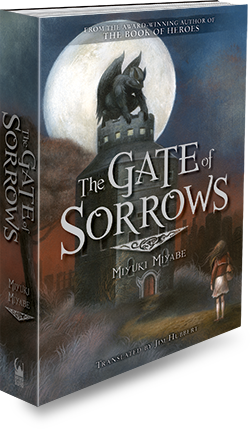 The Gate of Sorrows is an adult novel in the same universe as The Book of Heroes (Haikasoru, 2010). Her other works available in English include All She Was Worth, Cross Fire, The Sleeping Dragon, Apparitions, ICO: Castle in the Mist, and more. But the girl was afraid of one building, the only one that never had any lights, ever. It was right in front of her, out the window. She could see it in the rain-smoked light from the other buildings. Hulking, dark, alone. Mama had taught her how to count. One, two, curl your fingers. Or stick them out and count out loud. Counting that way, the scary building was a little more than three traffic lights from the apartment. The girl wanted to count the buildings between, but she ran out of fingers and didn’t know what to do next. So she counted the traffic lights. The building was peculiar. Mama had told her it was for business, but it had a different shape from the ones that made up the forest, and it was different from the nearer ones that seemed to be made of glass. To the little girl, the building looked just like the can of cookies one of Mama’s customers had given her a long time ago. There was a picture of Mickey Mouse on the outside, and cookies that tasted like cocoa nestled beneath the lid. This shape is called a cylinder. They don’t always have cookies. They hold all kinds of things. Tea, or candy. The little girl could see the round building whenever she looked out the window, like a dark pillar between her and the sparkling buildings in the distance. One, two, three. She had counted the number of stories on her fingers, with Mama’s help. The building had four stories. It looks like no one is using it. Mama had told her no one was living there, probably. The building was empty. That’s why the lights didn’t go on. No one was going in and out. The little girl had never seen anyone open or close the windows in the daytime. The roof of the building was a little bit funny. There was no railing. Instead, it was surrounded by a notched wall. The was a gap in the wall, at the left edge of the roof. There was something in the gap. At first she thought it was a somebody. That was the afternoon of the day they had moved to this apartment, before she found out the building was dark at night. Mama! Mama! Look, somebody is sitting up there! At first her mother was surprised too. She scrunched her eyes up and tilted her head this way and that. That’s not a person. It’s some kind of a bronze statue, Mana. It must be a roof decoration. A bronze statue. A decoration. Like the ones in the park, remember? That one’s a little funny though, isn’t it? It was funny. The little girl had never seen anything like it. She had said somebody was sitting up there because that’s just how it looked. But it wasn’t a somebody. It couldn’t be, because it had wings. What was it, this something squatting on huge legs, hunched over, brooding on the roof of that black pillar? In the girl’s eyes, that something was a monster out of the darkness, like in movies on TV or a picture in a book, a monster that spread its wings and rose into the air, slashing people with hooked claws. She wanted to take a closer look, even climb up to that roof. But maybe it would move if she got too close to it. It was a monster, after all. The girl looked at the monster every day. She wanted to be sure it hadn’t moved, that it wasn’t getting closer, that monster brooding in the center of the view she loved to look at from the window. The girl looked out the window, wrapped in her mother’s coat. The only trace of warmth in the freezing room was the fog of her breath. The monster was there now, in the winter storm and silver rain. Sometimes it disappeared in the sheeting downpour. Whenever that happened, the girl squinted to make sure it was still there. The monster is there. It’s just a statue. It’s not scary or anything. On the floor behind the little girl, her mother—the only person in the world she could rely on, and who herself was desperately in need of someone to rely on—was dying of pneumonia. Her five-year-old mind did not understand that death was near. She was too young to understand what death was. But instinctively, as a creature that lived, she knew death was close. It was coming for her mother, coming to take away her single mother, worn out by years of toil and hard luck, to leave her only child, who had only ever heard her name spoken by her mother, alone in the darkness of this tiny room. Death was coming. She could feel it. She wanted to snuggle up to her mother, but it was forbidden. All she could do was look out the window. But she could be a sentinel. She could watch to see how close death was. The monster would show her. If it moved, if it spread its wings, if it kicked off into the sky from that gap-tooth rampart, she would know. Maybe she had been wrong to stare at it every day. Maybe looking at it so much made it notice her and Mama. Her mother was wracked by another violent coughing fit. Then her throat made a different sound. It was like the wind blowing through the gap in the window frame. A creaking hiss. The rain poured down the glass. Everything was blurred. The girl wiped the glass with a little hand. The freezing window raised goose bumps on her arms. The monster would come. It would start to move. What would be scarier, to watch or turn away? She would hide in her mother’s bed, put her back close against her mother’s back. Mama, the monster is coming! In vain, her mother gasped for air. That was when she saw it. An enormous darkness descended onto the roof of the black pillar. It Google Chromecast seemed to drop from the sky and alight by the hulking statue. Yes, it moved. It didn’t just appear, like pushing a switch. It didn’t come out of the shadows. It came down from the sky. Out of the swollen clouds, beyond the sheets of silver rain. This new darkness was bigger than the squatting monster. The inky silhouette was shaped like a person. Its hair was long. Its arms and legs were long too. And like the monster, it had wings.